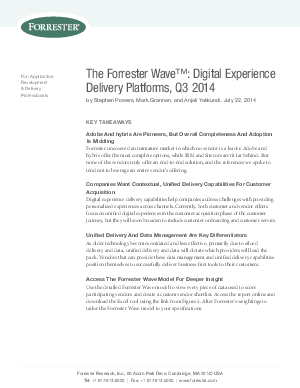 Adobe received the highest score for current digital experience (DX) delivery offerings in The Forrester Wave™: Digital Experience Delivery Platforms, Q3 2014 report. And, we’re continuing to innovate. Since the evaluation, we’ve launched several new capabilities that include richer support for mobile apps, increased usability through visual workflows, and a master marketing profile. “Strategically, Adobe differentiates with its vision of the connective tissue between its tools, and its aim for single customer profile.” – Forrester Research, Inc.